The HX711 load cell amplifier is used to get measurable data out from a load cell and strain gauge. 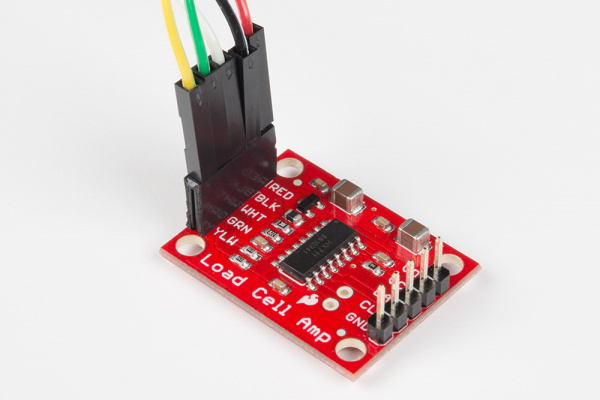 This Hookup Guide will show you how to get started with this amplifier using some of the various load cells we carry at SparkFun. If you aren't familiar with the following concepts, we recommend reviewing them before beginning to work with the HX711 Load Cell Amplifier Board. Depending on the type of load cell you are using, the configuration of how it should be hooked up to plates or surfaces will change. We'll list a few different types of setups below. 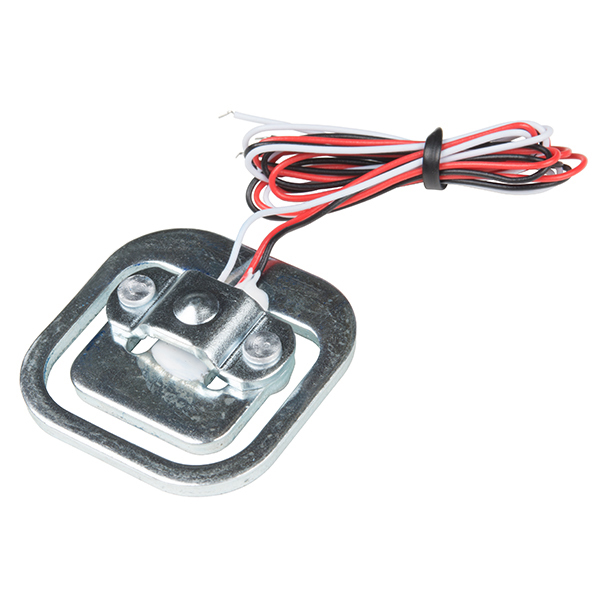 Usually with larger, non-push button bar load cells you will want to hook up the load cell between two plates in a "Z" shape. 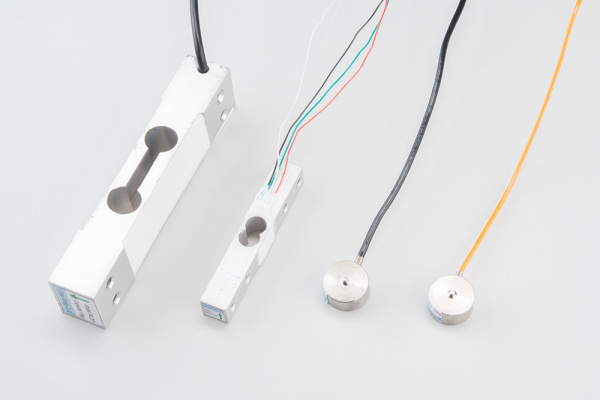 As shown below, the bar-type load cell is mounted with fitting screws and spacers so that the strain can be correctly measured. Note that only one side of the load cell is screwed into each board when a bar-type load cell is placed between two plates. This provides a moment of force, or torque, on the strain gauge rather than just compression force, which is easier to measure and much more accurate. 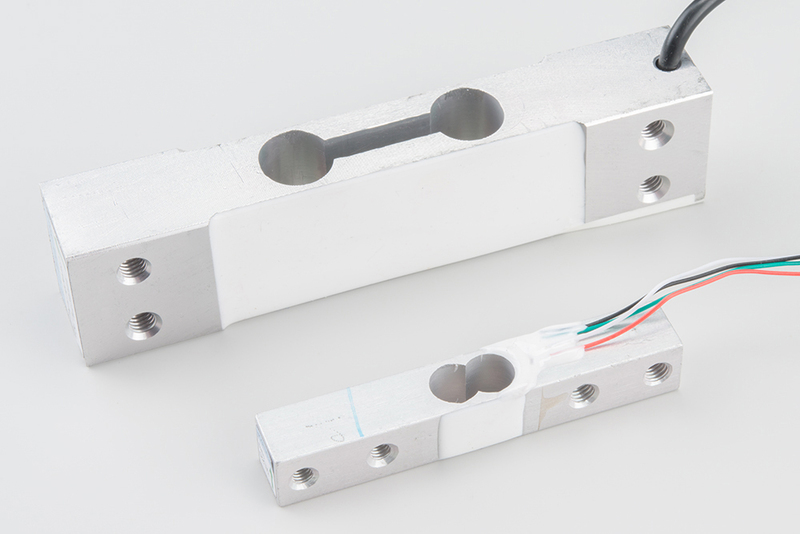 S-type load cells can measure compression, tension, or both due to its design. Besides placing the load cell between plates, the s-type can be used to measure suspended tanks or hoppers. You can think of this as a load attached to a crane. Below is an s-type load cell with two threaded, rod end bearings. 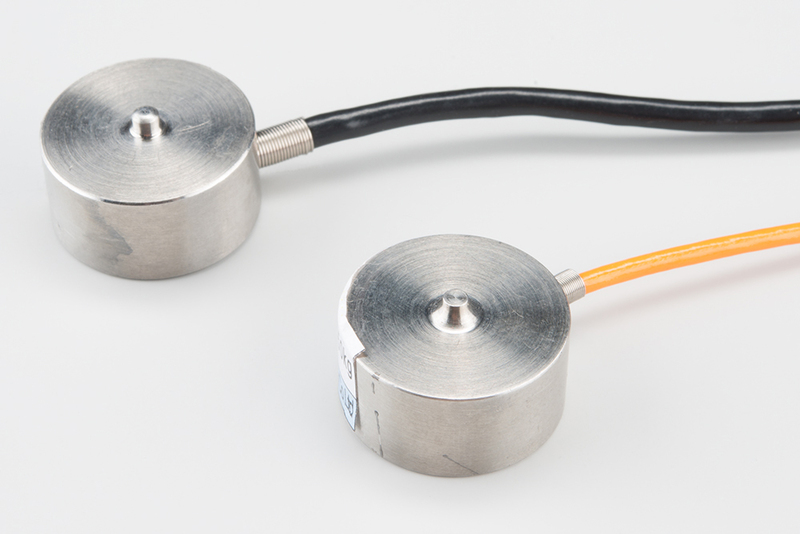 For single, strain gauge load cells, they can be placed at equal distances with respect to each other underneath a platform. The image below shows four, single strain gauge (i.e. the load sensor) arranged in a wheatstone bridge configuration. This configuration is also possible with four button-type load cells. 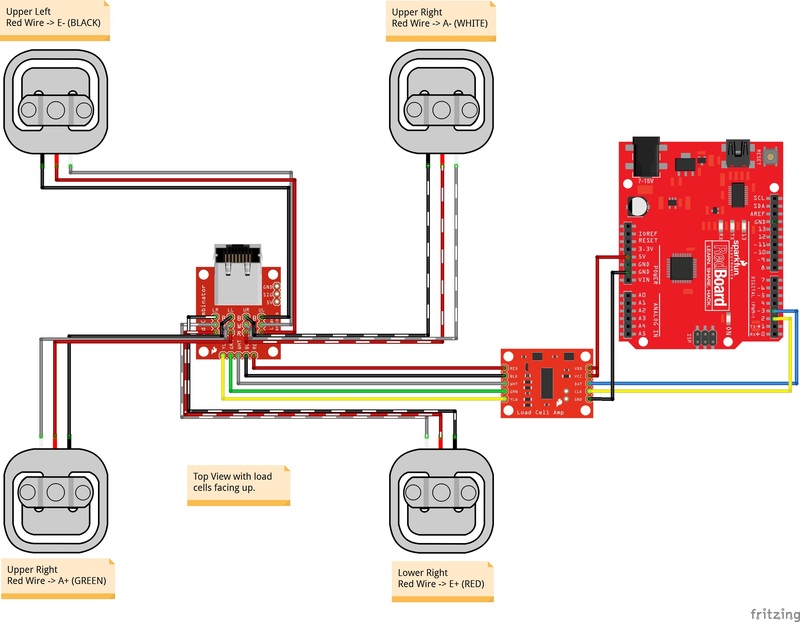 Note: If you are hooking together four of the SparkFun Load Sensors using the Combinator board, you should position the four load sensors equidistant from each other, just like the bathroom scales shown in this tutorial. 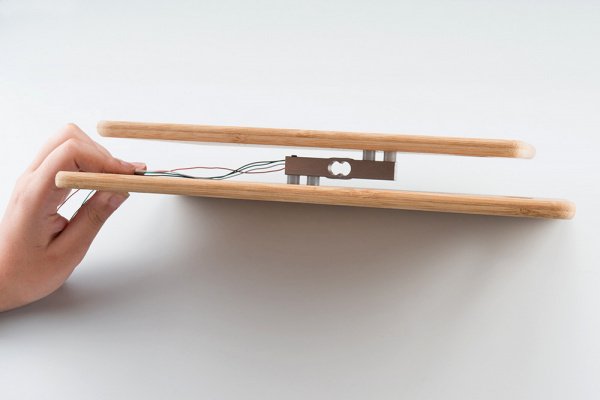 For smaller, push-button or disc load cells, you will want to make sure to screw in the disc to a bottom plate (or surface you are measuring force against), and center the beam, plate, or whatever else you are wishing to measure the force of onto the "button" on the top. Usually another plate with a hole is used to make sure whatever you are measuring is hitting the same spot on the load cell each time, but it is not necessary. 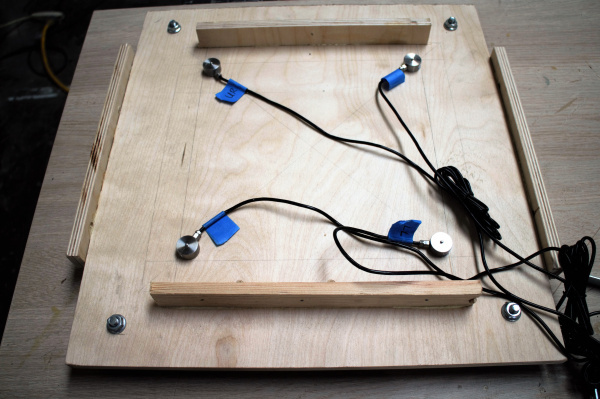 Below are images of four button-type load cells placed at equal distances with respect to each other under a platform. Make sure to read the datasheet for the load cell you are using and get the correct screws to fit into it. Load cell measurements can be off by +/- 5% due to a range of things including temperature, creep, vibration, drift, and other electrical and mechanical interferences. Before you install your scale, take a moment and design your system to allow for easy calibration or be able to adjust the code parameters to account for these variations. 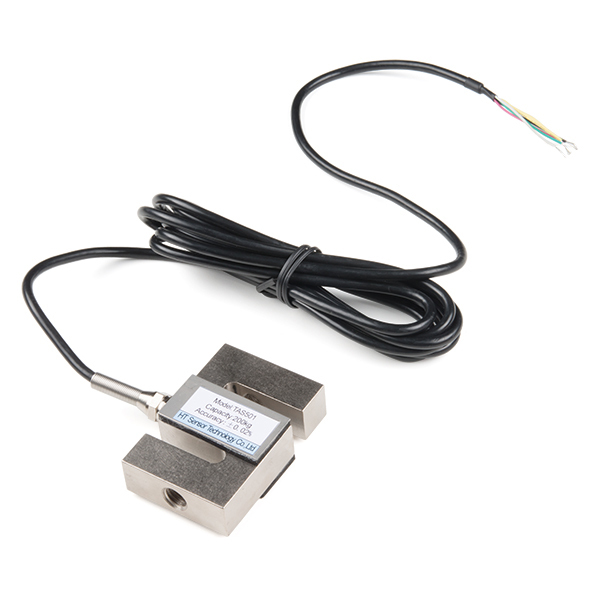 The HX711 Load Cell Amplifier accepts five wires from the load cell. These pins are labeled with colors; RED, BLK, WHT, GRN, and YLW. These colors correspond to the conventional color coding of load cells, where red, black, green and white wires come from the strain gauge on the load cell and yellow is an optional ground wire that is not hooked up to the strain gauge but is there to ground any small outside EMI (electromagnetic interference). Sometimes instead of a yellow wire there is a larger black wire, foil, or loose wires to shield the signal wires to lessen EMI. In general, each load cell has four strain gauges that are hooked up in a wheatstone bridge formation as shown below. Some load cells might have slight variations in color coding such as blue instead of green or yellow instead of black or white if there are only four wires (meaning no wire used as an EMI buffer). You might have to infer a little from the colors that you have or check the datasheet on the load cell, but in general you will usually see these colors. If the readings from the HX711 are opposite of what you are expect (for example the values decrease as you increase weight) simply reverse the O+/O- wires. 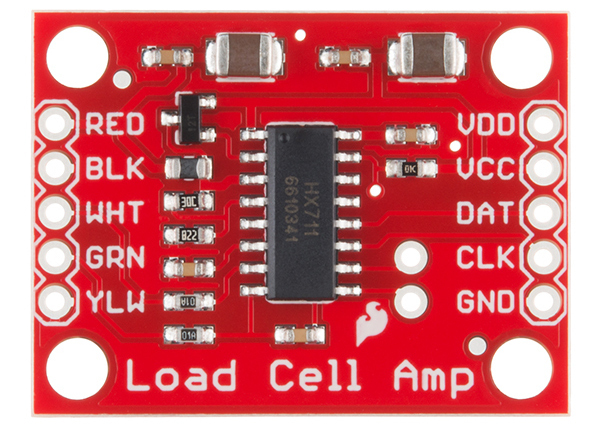 Once the load cell is is hooked up to the amplifier, you can hook up VDD, VCC, DAT, CLK, and GND to a microcontroller such as a RedBoard or Arduino board. Note: VCC is the analog voltage to power the load cell. VDD is the digital supply voltage used to set the logic level. PRO TIP: In many cases, you can just short VCC and VDD together. 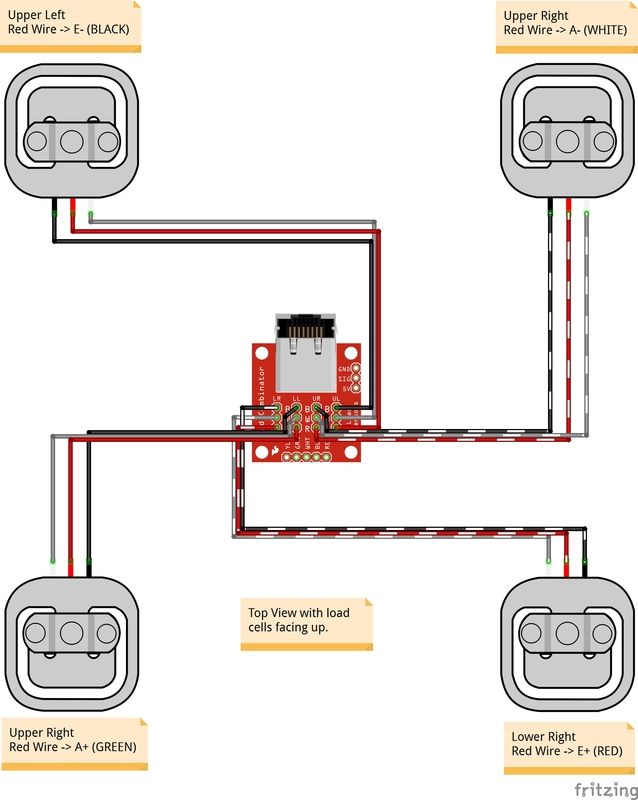 If your microcontroller uses 3.3V logic however, you'll want to connect VCC to 5V and VDD to 3.3V. The example code has DAT and CLK hooked up to pin 3 and 2 respectively, but this is easily changed in the code. Any GPIO pin will work for either. Then VCC and VDD just need to be hooked up to 2.7-5V and GND to ground on your microcontroller. 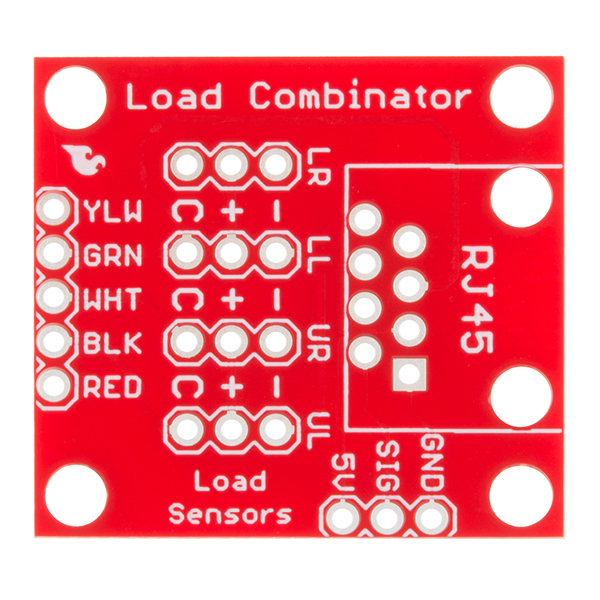 Note: The combinator board also has room for an 8 pin RJ45 socket, which can be used to connect your project via Ethernet cables for long distance applications. Another nice thing about our combinator board is that most home scales use four single strain gauge load sensors, so this is a handy board for hacking your own scales at home! For load sensors, there isn't a set color coded standard. The hacked home scale can have different wire colors. 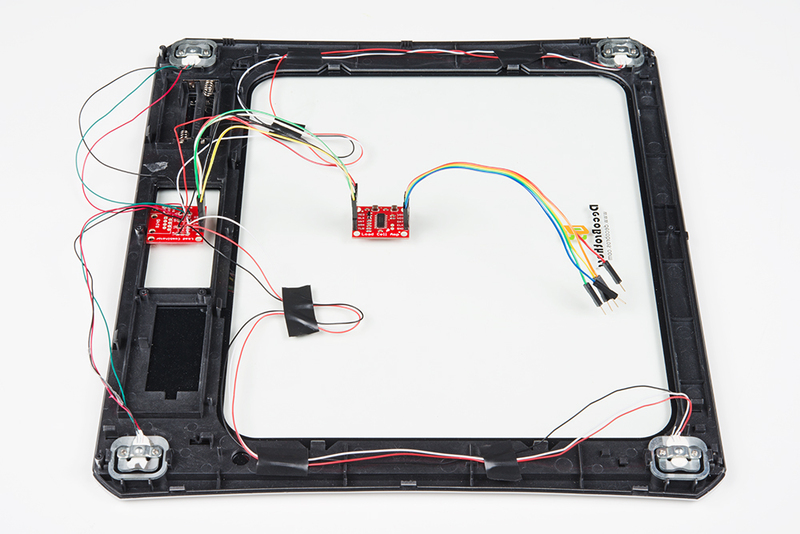 Comparing the scale pictured above with the load sensor schematic, while the black wires matched, the red and white wires were swapped. Also, only two of the four sensors used a white wire for the 'center tap' of the load sensor, the other two used green. I connected the black wires to "-", the red to "+", and the white and green wires to "C". 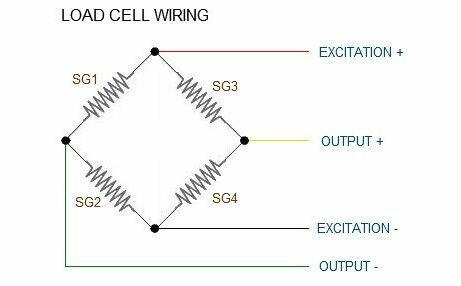 To determine how to hook up your single strain gauge load cells to the combinator, measure the resistance with a multimeter between the three wires. You should find a larger resistance (close to double) between a pair. In our example, the resistance between red and black was 1.6 kΩ (i.e. 1600&ohm;), and the resistance between white/green and red was 800 Ω. Therefore, the center tap to the strain gauge is the white/green wire. 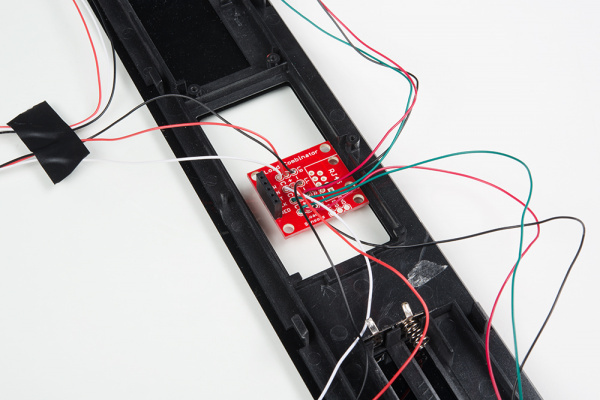 The center tap or center pin of your strain gauge connects to the "C" pin on the combinator. The larger resistance wires (red and black in this example) connect to the "+" and "-" pins on the combinator. Once you have the combinator board successfully soldered to the twelve wires, you can now connect it to the HX711 amplifier board via the 4 standard load cell wires. Connecting the yellow pin is optional. You can use short jumper wires or if your electronics are a long distance away from your scale consider using an RJ45 connector and an ethernet cable to connect the combinator to the HX711 amplifier. When finished, your setup should look similar to the image below. 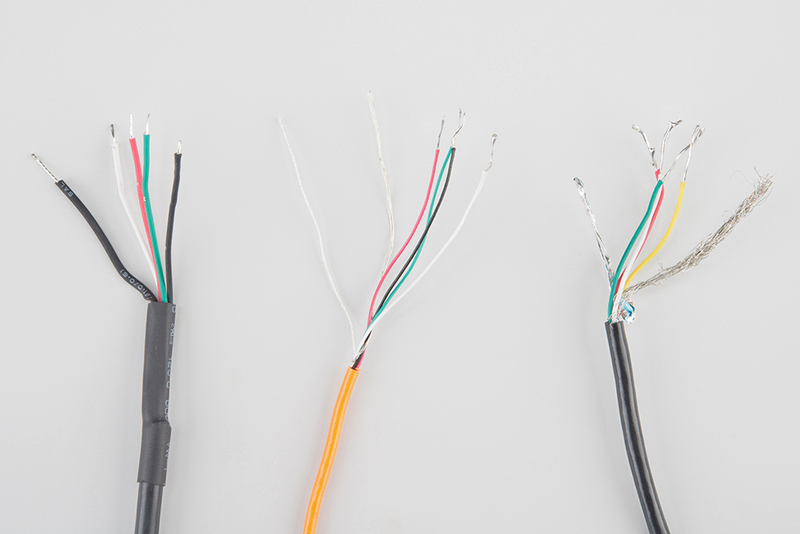 Make sure to secure the wires before placing it in an enclosure. 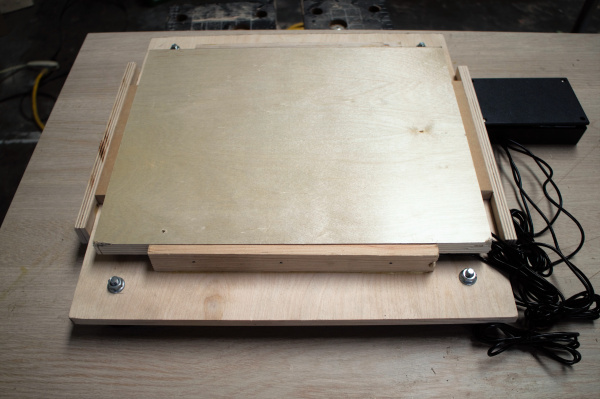 Now that you have your load cell, amplifier, and microcontroller hooked up, you can add your code and start calibrating your setup. You will need to download the excellent HX711 library from user bogde. 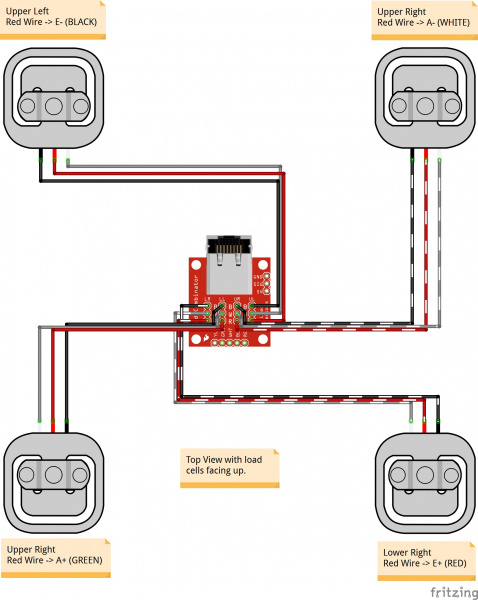 As of the writing of this tutorial, the library has been tested on ATmega328P, ESP8266, ESP32, and STM32. Open the Arduino IDE&apos;s library manager and search for "HX711 Arduino Library". Click on the library to install. You can also download the *.ZIP file from the GitHub repo to manually install the library. You will also need to download the most up-to-date example code from the GitHub repository to follow along. The first thing you will want to work with is the calibration code "SparkFun_HX711_Calibration.ino" from the SparkFun examples. Check out the other example codes provided in the GitHub repo for powering down the HX711 and known zero startup ). Now that you've successfully got your HX711 up and running, it's time to incorporate it into your own project!